At Harmony Dental Care, Dr. Kalil Abide works with you at every step of the dental implant process. From planning and placing your dental implant, to designing and securing your final restoration, Dr. Abide combines his expertise in implant surgery and experience performing smile makeovers to provide you with results that look and feel like a natural tooth. In addition to helping you achieve a high quality, permanent tooth replacement, Dr. Abide will be your partner in helping care for the implant and restoration, ensuring you maintain your beautiful smile for years to come. If you are missing teeth and are looking for the best lifelike restorative option, dental implants might be the ideal solution for you. These titanium posts are permanently placed in the jawbone, and allow our Jackson dentist, Dr. Kalil Abide, to deliver a beautifully crafted dental restoration that appears and functions just like your natural teeth. With today’s modern technology, whether it’s replacing one tooth or utilizing the All-on-4® method or Same Day Teeth™, dental implants have become the standard for tooth replacement. With a deep commitment to providing the absolute best dental care, Dr. Abide can oversee your entire dental implant procedure to ensure incredible, long-lasting results. To find out if you are a candidate for dental implants, contact Harmony Dental Care of Jackson, MS today. If you are missing one, several, or even all of your teeth, implant-supported restorations are a great option to restore the quality of your oral health. To qualify for implants, you must have an adequate amount of healthy bone in your jaw to support the implant post. Because bone degeneration is a common side effect of tooth loss, Dr. Abide will carefully evaluate your overall oral health to determine if there is sufficient bone for implant placement. If not, there are many bone grafting techniques available that can be performed to replace deficient bone. Ultimately, if you suffer from tooth loss or have severely damaged or decayed teeth, you are a candidate for dental implants. The days of dentures slipping out of place are gone. Implant supported restorations are permanent fixtures of the oral cavity giving you back that self-esteem you might have lost over the years. Because of their durability and Dr. Abide’s top-quality care, implants are a wise investment in your dental health. After integration of dental implants, they generally remain for a lifetime saving you significant expense in the future. Your implant-supported restorations will be custom-made to match your natural teeth and complement your facial structure. They are virtually identical to your natural teeth in appearance and function while restoring your bite. Implants are the only type of restorative dentistry that is beneficial in restoring your jawbone to good health. Due to their ability to resemble our natural root form, implants maintain and prevent further degenerative disease, reducing your risk of tooth loss while maintaining the shape of your jawbone and face. The benefits of dental implants are many. If you suffer from poor dental health, we encourage you to consider all of your options. 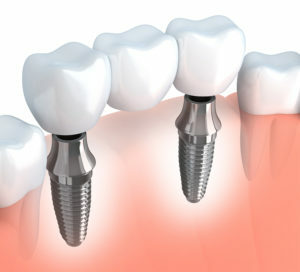 Dental implants can be utilized for different types of restorations, depending on your specific tooth replacement needs. During your consultation, Dr. Abide will perform a thorough oral evaluation to determine which implant solution can provide you with the best possible results. 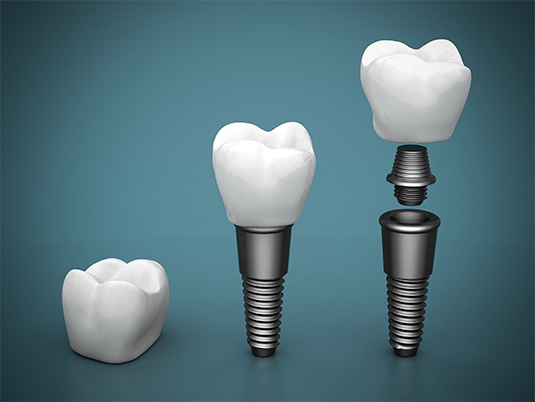 Candidates for dental implants can typically benefit from either a single tooth implant, implant supported bridge, or implant supported denture. If you are only missing one tooth, or have multiple missing teeth in different areas of your mouth, Dr. Abide may recommend single tooth implants. This implant type involves the use of one dental implant post in the place of each missing tooth root. A dental crown is then attached to each post to restore the look and function of the missing tooth. When multiple teeth are missing next to each other, implant bridges may be the ideal replacement option. Similar to traditional bridges, implant supported bridges utilize one restoration to replace multiple teeth, but they differ in that they are anchored to the jawbone with dental implants, providing increased stability and preventing bone recession. Patients missing entire arches of teeth can obtain the most natural-looking and -functioning replacement by opting for implant dentures. This advanced teeth replacement involves a full-arch restoration that attaches to multiple dental implants placed along the arch. For some patients, Dr. Abide may utilize the All-on-4® treatment concept, which only requires four implants. What Can I Expect in the Dental Implant Procedure? Before you can receive implants, Dr. Abide will need to conduct a complete exam to determine your candidacy for this treatment. He will then customize a treatment plan taking into consideration your dental health while maintaining your dental goals. A treatment conference with Dr. Abide allows him to organize the entire implant procedure to make sure that you receive the highest level of care with minimal discomfort while not compromising treatment. The number of implants you receive will depend on the type of restoration (dental crown, bridge, partial or full denture) and the amount of bone you have available. If you are lacking bone for implant placement, Dr. Abide might suggest a bone graft prior to implant placement. Once, the implants are surgically placed, it typically takes four to six months for your gums and bone to heal. As you recover, your bone and soft tissues will close around the implants becoming a permanent part of your jawbone, taking the place of your missing tooth roots. Dr. Abide will monitor your progress, and when your implants have fully integrated, he will move forward with the restorative plan whether it’s a crown, bridge, or implant supported denture. Other than the traditional implant options, Dr. Abide offers other procedures such as the implant-supported denture, All-on-4® method. During this procedure, Dr. Abide will use four to six smaller implants, placing them at a slight angle to minimize the impact on surrounding tissue. This process allows placement of an implant denture the same day. In some cases, he can even provide single tooth implants utilizing a temporary restoration until healing has taken place for your permanent restorations. When I looked in the mirror… I was extremely happy with the results. Dr. Abide had basically reconstructed my smile from the ground up, giving me back my trademark. When dental implants are placed by a qualified and experienced professional, they gradually fuse to the jawbone and become a permanent part of your mouth. As a result, they are considered a lifelong investment that should never need to be replaced. However, the restorations that are placed on top of implants—whether this is a crown, bridge, or denture—are prone to gradual wear and tear over time. With this in mind, you may eventually need to replace your restoration after several years. To ensure your dental implant restorations last for as long as possible, Dr. Abide will help you understand how to care for them and what steps you can take to prolong their lifespan. Insurance coverage for dental implants will vary based on your provider and specific plan. Many dental insurance companies will cover the most affordable tooth replacement option (such as a bridge or denture), but not the dental implant procedure, since it is typically deemed elective. The best way to learn if you have coverage for the cost of dental implants is to contact your insurance provider. Our friendly and knowledgeable staff is happy to assist you in navigating your dental insurance benefits to make the payment process as straightforward and stress-free as possible. Since dental implants are designed to act like your natural teeth, caring for them will be similar to how you maintain your other teeth. Routine oral hygiene habits, like brushing twice and flossing once daily, as well as attending regular dental checkups and cleanings can help you preserve your dental implants for decades, if not a lifetime. Whether you are not a good candidate for single tooth dental implants or would simply like to learn about your other tooth replacement options, Dr. Abide will help you understand all of your alternatives. Although dental implants can provide the most lifelike replacement for a missing tooth, other solutions are available for filling gaps. For instance, implant supported bridges and implant dentures provide similar benefits to single tooth implants, but they require fewer implant posts and can replace more teeth at once. This allows many patients who are not candidates for several individual dental implants to still be able to receive anchored restorations. As an alternative to all dental implant solutions, Dr. Abide can educate you on the benefits and limitations of traditional options like bridges or dentures. Your comfort and safety are extremely important to us, which is why Dr. Abide will not recommend dental implants unless you have a high chance of success with minimal risk of complications. In general, dental implants are considered safe and effective, as they use a trusted titanium material that has been employed for decades. Although dental implant surgery is regarded as safe when performed by a qualified professional, the procedure does come with some degree of risk, as does any surgery. Dr. Abide will discuss these risks with you during your appointment, thoroughly explaining the pros and cons of the procedure so you can make a well-informed decision about your care. Contact Harmony Dental Care to have Dr. Abide determine which treatment is best for you. During your complimentary consultation, we will also answer any questions you may have about dental implants and the many factors that influence the total cost of this restorative option.